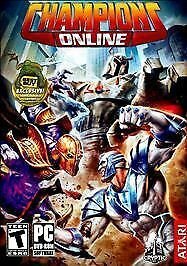 Champions Online PC Game This is a BRAND NEW - FACTORY SEALEDAll Sales are FINAL & Sold “AS IS” Unless otherwise stated NO Warranties Implied or Otherwise. Seller DOES NOT GUARANTEE VALIDATION OF CD-Key Codes if Game requires one.Payment for item is due within 48 hours after product ends. If you have a feedback less than 10 please contact seller prior to looking.All items are shipped within 48 Hours after payment confirmation is received.WILL COMBINE SHIPPING$3.00 FOR EACH ADDITIONAL GAME IN & OUTSIDE OF USSHIPPING TO CANADA &UK $5.00 FOR 1ST GAME Shipping to Australia & Brazilis $8.00All other countries, please contact Seller for Shipping Costs before looking.All Items are Sent via USPS 1st Class Mail. If you want a Tracking Number then you would need to request Delivery Confirmation (.75).Delivery Confirmation is optional. Please advise PRIOR to paying if you want so the ADDITIONAL Costs can be added to the invoice prior to checkout.Intenational orders requesting Ins. or a Tracking Number MUST SHIP PRIORITY MAIL! Please contact me for shipping costs.If your item(s) get lost or damaged, Buyer is responsible for filing all claims with the Post Office.Check out the other Items I currently have Listed &Be sure to add me to your favorites list! "Thanks for Looking & Good Luck!!"